What Are They and Do You Need One? Kitchenettes: What Are They and Do You Need One? 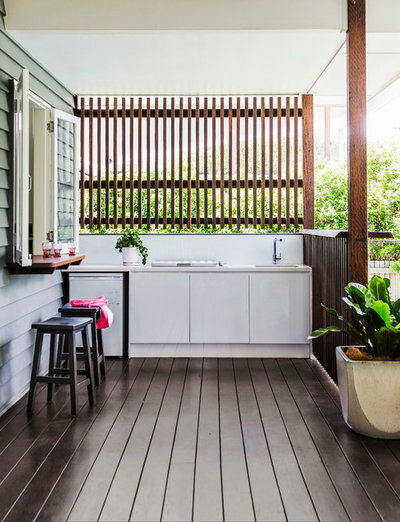 At Houzz, we’ve noticed kitchenettes popping up in wildly different areas of the home – inside and out, freestanding and dependent on the main cooking space – and for good reason. 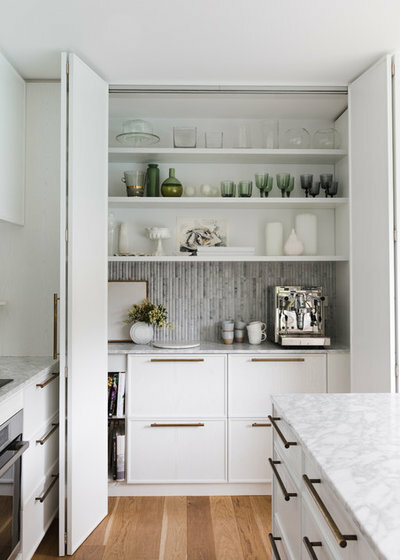 We ask three kitchen designers about the pros, cons, rules and costs associated with incorporating these pocket pantries and cooking zones into your home. 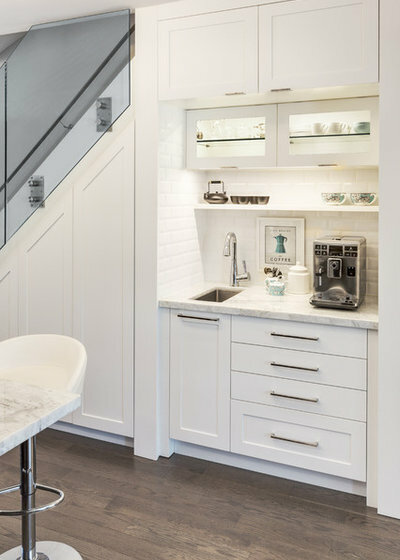 Anne Ellard, designer at Kitchens by Kathie, describes a kitchenette as a mini-kitchen. 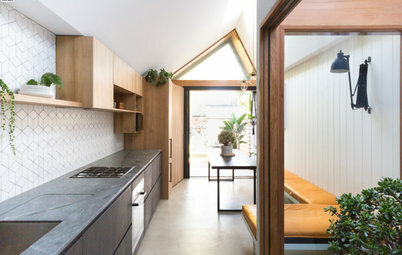 “It can either be the main kitchen of a small living space or it can be secondary to a main kitchen in a larger home,” she says. 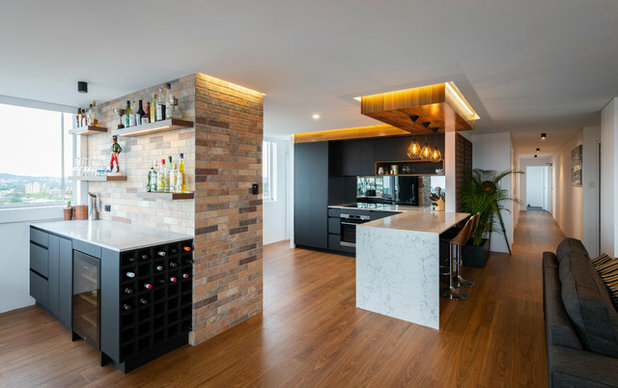 Steve Johnson, director at Retreat Design, adds that until recently, kitchenettes have been a design feature distinctive to densely populated areas. 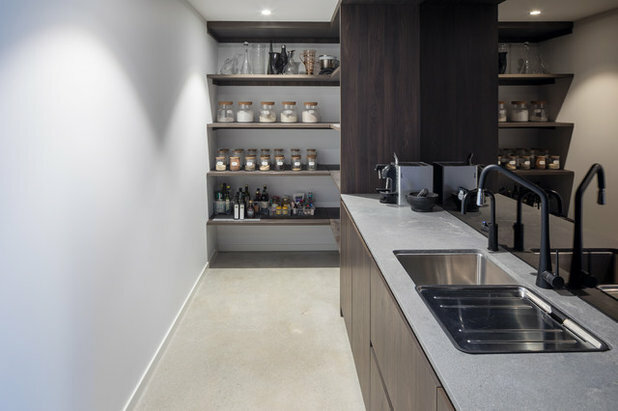 “Kitchenettes are traditionally found in apartments that are historically in urban hubs and cities, so shopping regularly for consumables to compensate for reduced storage space is a realistic option,” he says. What forms do today’s kitchenettes usually take? 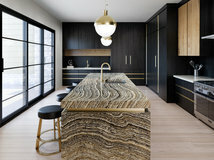 “We’ve seen a huge evolution in kitchenettes in the home,” says Chris Ruffé, director of Bondi Kitchens. 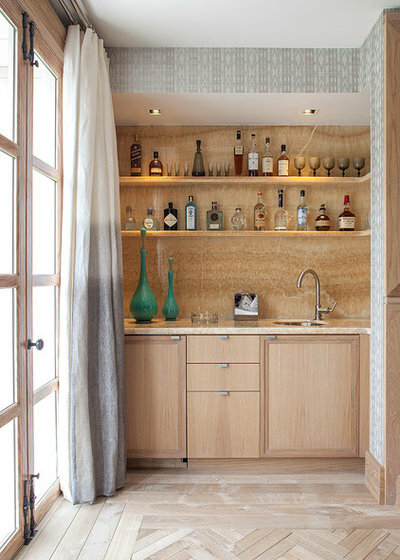 “They come in many forms, such as a bar for adults only, a butler’s pantry to reduce daily traffic in the main kitchen and sculleries have made a comeback to hide washing-up tasks.” Ruffé notes that depending on their purpose, kitchenettes can be hidden or visible within a home’s floor plan. 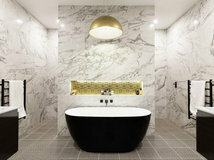 “Bars are given serious attention from a design perspective, they are on-show and ready to impress,” says Ruffé. 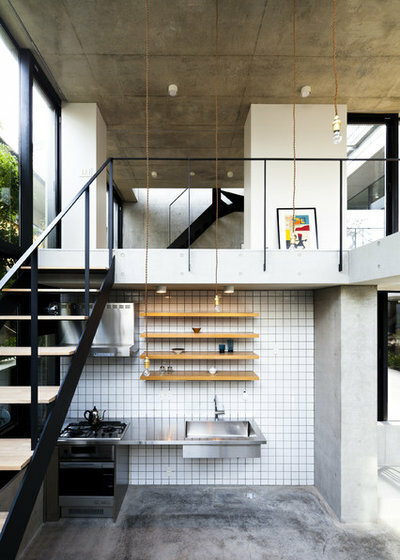 “Larger bars generally house a fridge and freezer, dishwasher or dish-drawer and also a sink. Why are these pocket-sized spaces in vogue? 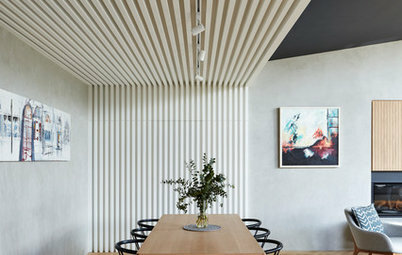 “Open-plan living design has meant people are moving towards sculleries and butler’s pantries as a way to hide their cooking and preparation mess,” says Johnson. Ellard also believes the rise of websites such as Airbnb, where people can rent out their homes for short stays, has contributed to the kitchenette’s growing popularity. Are there any disadvantages to adding a kitchenette? 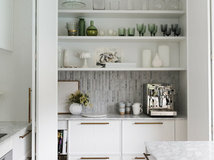 Where can I incorporate a kitchenette at home? 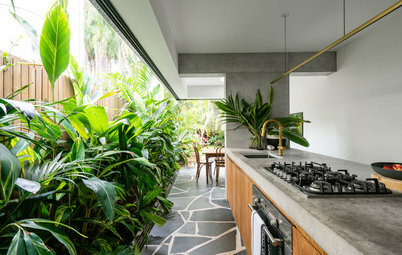 Kitchenettes are cropping up alongside central cooking zones to reduce foot traffic into the main kitchen, in dining areas to serve as coffee-making stations, in living areas to function as home bars, in alfresco areas to allow for outdoor cooking, and in granny flats, studios and guest rooms to give visitors the freedom to prepare a beverage or simple meal independently. 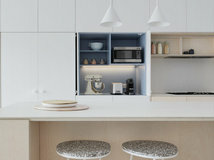 Do different ‘rules’ apply when designing a kitchenette? 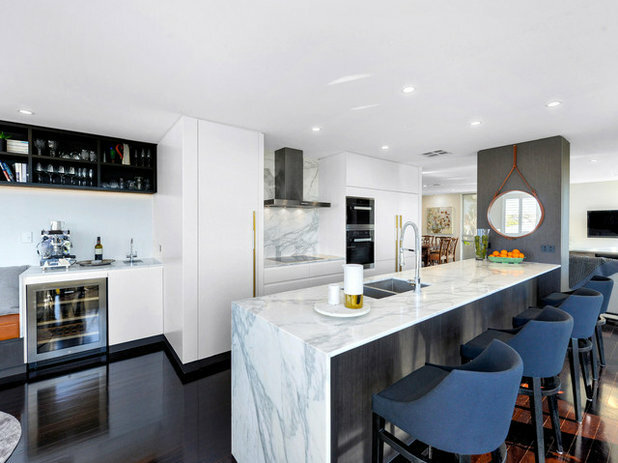 Nevertheless, rules still apply to kitchenettes for safety purposes and it’s best to check with your council to ensure your kitchenette adheres to local regulations. 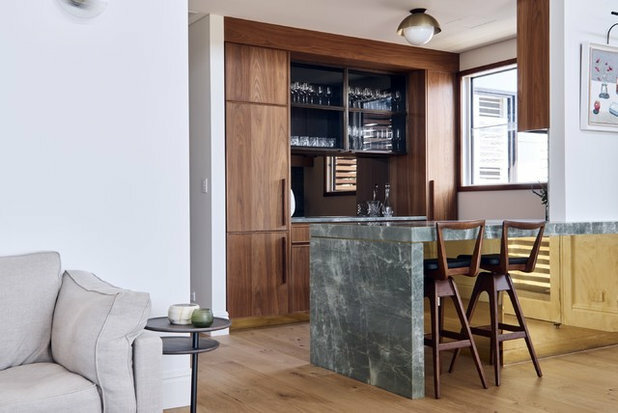 “It’s still imperative that industry regulations are followed when planning a kitchenette to ensure that, for example, required clearances and ventilation around cooking appliances are allowed for,” says Ellard. What designs are popular for kitchenettes? 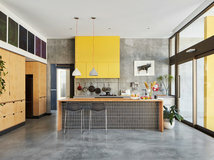 Kitchenettes also pose a great design opportunity to play with colour or be bold with materials or patterns that people may find overwhelming on a larger scale. “The main thing to keep in mind here is access to plumbing if a sink is to be added,” says Ellard. What are the essential inclusions for a kitchenette? For Ellard, the must-haves for a kitchenette are appliances and utensils that can perform more than one function. “Using a tap that can dispense both boiling and chilled water eliminates the need for a kettle,” she says. Johnson agrees, and adds that a kitchenette’s must-have inclusions vary depending on the function it needs to serve. 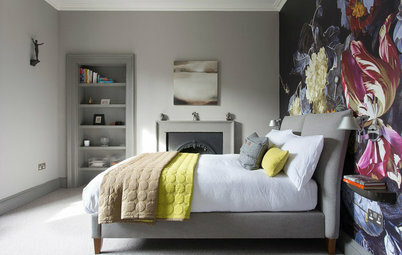 Ellard also believes that drawers trump cupboards every time, especially when space is tight. 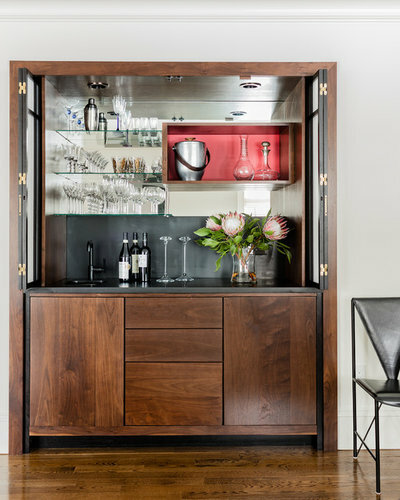 “They offer much more practical and accessible storage space than cupboards and can be used to store a multitude of items from dried food to plates, pots or even glassware,” she says. 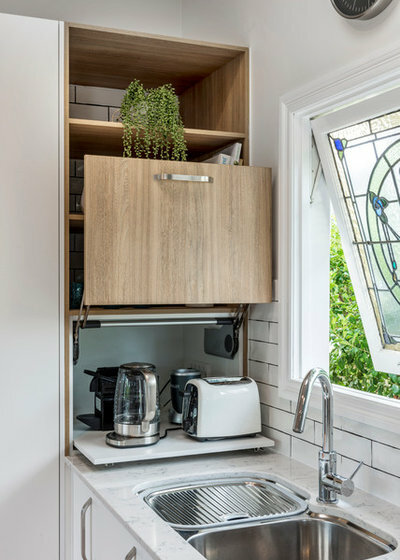 Does it cost less to design and build a kitchenette than a regular-sized kitchen? 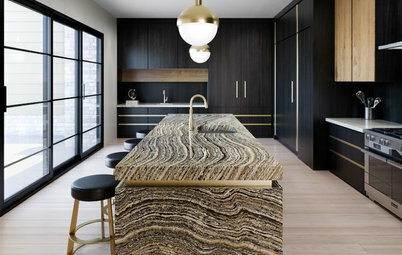 “Matching a designer kitchen, the kitchenette would cost anywhere from one- to two-thirds of the kitchen,” says Ruffé. Where in your home would you love a kitchenette? Tell us in the Comments below, like this story, save the images and join the conversation. 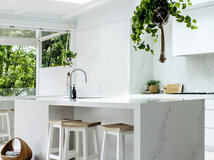 Whether you're looking at ideas for kitchenettes because you're downsizing your living space to an apartment (or even a tiny house) or because you're looking to allow for another generation, either younger or older, in your larger home, you're likely to consider how the kitchenette area is going to be housed. 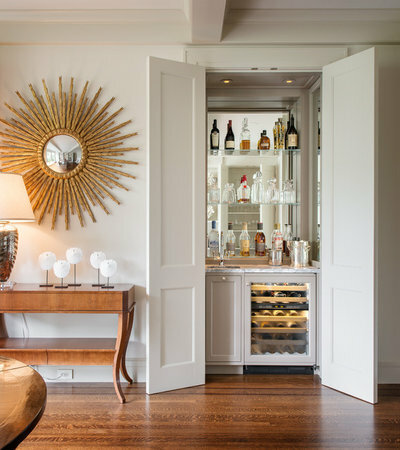 Either way, you need to consider how much space the doors will take up when open and, in the case of a cupboard-based work area, will the doors block walk through areas or light when open? 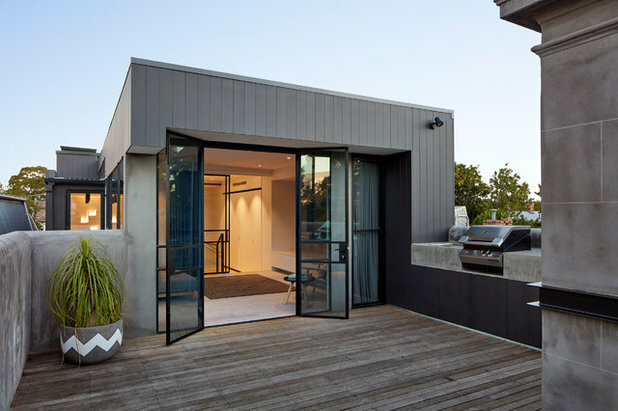 For NZ-based Houzzers, Fit distribute a couple of high quality bifold door options that are well worth considering; Cinetto and Salice. 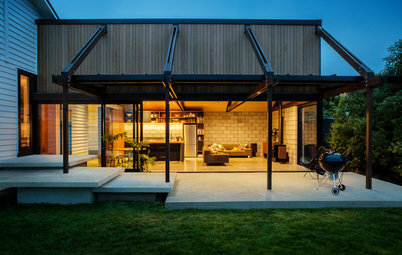 Check out our Houzz Cinetto Bifold Project here. 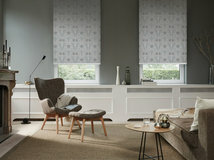 Or see Cinetto on our website here. Read about Italian designed and made Fit bifold door gear on our website here or in our Houzz Salice Bifold Project here. 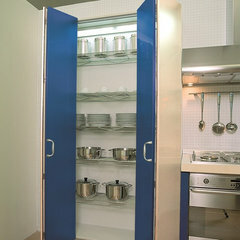 A marvellous option for cupboard based kitchenettes or work areas is a pocket door, a mechanism that attaches to cabinet or cupboard doors and allows the door to pivot 90° to slide back to sit within a double cabinet wall. 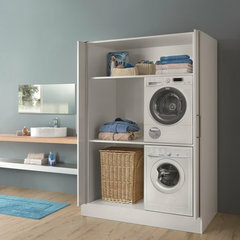 This is ideal for when you have limited space and traditional doors would get in the way when open. Salice's Eclipse pocket door mechanism is highly specced and worthy of your consideration. 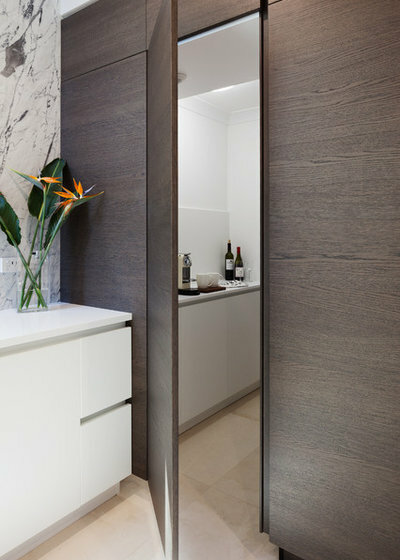 Check our out Houzz Salice Eclipse Pocket Door Project here or read about Eclipse on our website here, where you can also see video clips of Eclipse in action. 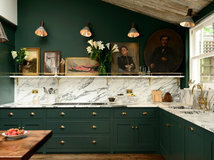 Kitchenette, scullery, butlers pantry; all ideas that were popular in the past for various reasons and appear to be making a comeback. I have what I suppose you would call a kitchenette in my newly refurbished unit. 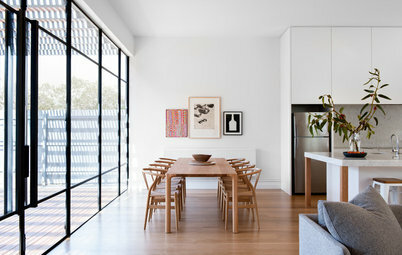 Small living space which needs to accommodate dining, day living and kitchen. So in my kitchenette I have a good sink, single dishdrawer, 2-burner induction cooktop and combo oven/microwave. All chosen to maximise storage. 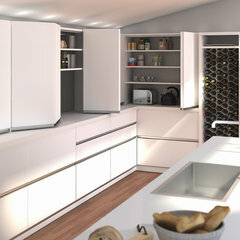 Also a good sized pantry cupboard and a fridge-freezer. There are overhead cupboards and mainly drawers underbench, and a useful swivelling thingie to make use of the dead corner. A bank of shelves for jars of dry goods, magnetic knife rack and a hanging rod for utensils have all been useful additions. This kitchenette is ideal for one person and I can entertain easily with my friends sitting round the table or on the settee. I tend to think these separate rooms shut off from the kitchen will require more walking, more time and effort needed to prep and cook, clean up. 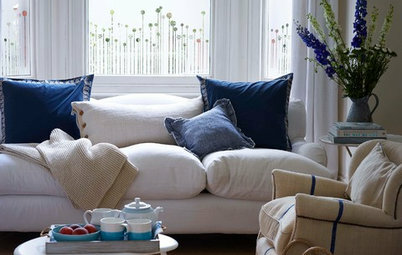 Tidier perhaps but you are then shut away in another space while your guests entertain themselves! Not my cup of tea! Handy of course if you employ staff! The butler! Or scullery maid! I was brought up in a house with a kitchen, scullery and pantry! No butler or maid, just my mother, cooking and baking all day for a large family and all the farm workers who trooped through the house at regular intervals. And of course all the friends and family who descended on "the farm" every holiday time. We all helped of course but it was hard work for my mum, especially for the first few years with no electricity. 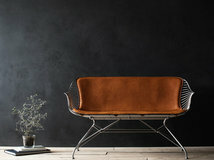 In the kitchen was the coal range, a large wooden table and chairs and a sagging Victorian chaise we all perched on or curled up on for a story. The scullery had sink, bins for bulk drygoods and poky cupboards. And in the pantry was a safe and many shelves filled with preserves and other foods. The kerosene fridge was out in the back porch! Primitive! But happy times!! I have no wish to go back to the trekking my mother did, through the various rooms in the work area, in order to prepare a meal. Happy with my current arrangement where I can stand in one spot to do the lot! Before you opt for a boiling/chilled water tap in order to save space, consider 2 things: the not insignificant running costs (filter renewal and power), and the huge space taken up by the unit hidden under the sink. It fairly much precludes using any space saving drawers in that space. 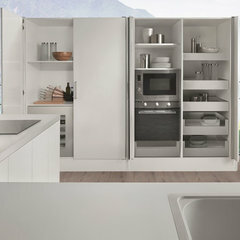 If you have a corner return cupboard - usually fairly inaccessible space - that would be a good location for it. 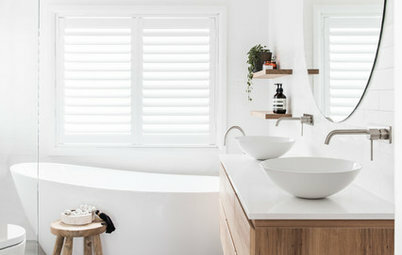 However, if you do have such a unit under the sink, make use of the heat it generates by fixing tea-towel rails to the inside of the cabinet doors, then they dry in no time.